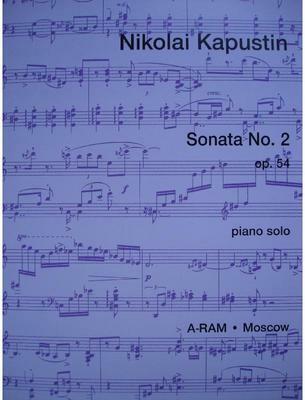 Kapustin composed his second Piano Sonata, op. 54, in 1989, and it is the longest of the sixteen he has written to date. A hugely extrovert work, this sonata combines many disparate stylistic elements into a carefully controlled four movement structure: a vigorous first movement, a muscular scherzo, an unhurried and dream-like Largo and an explosive perpetuum mobile with a remarkable 8+7+8+5 time signature. Like all Kapustin's piano works, this was composed at the keyboard and every note fits under the hand beautifully, making a performance as joyful for the pianist as it is for the listener. The confidence and ebullience of this Sonata are evident from the first bar to the last, as an uninhibited performance will amply demonstrate. What do you want to know about Piano Sonata No 2 op 54 by Nikolai Kapustin?